My heart feels like it’s being ripped open. I am a witness to the horrific abuses that Wild Animals are facing and I weep to the depth of my Soul. WHY? Why would anyone treat any life, human or animal in such unkind and cruel ways? Isn’t Animal Abuse one of the very first signs in a criminal profile of a mentally ill person or criminal? I am a well-known Animal Lover, Animal Communicator, Holistic Dog Trainer and Advocate for All Life. I wear my heart on my sleeve and believe in the daily practice of Respect and Reverence for All Life. I have studied with Taoist and Native American teachers and with many domesticated animals and Wild Ones. I learned to thank Mother Earth every single day for all of the beauty and bounty she provides us daily and I ask for forgiveness on behalf of those who forget to be grateful to her. I learned to apologize to her and the Wild Ones being abused and killed daily for our destruction and trespasses on her without asking and being granted permission. I learned to ask her forgiveness for our technology disrupting her natural communication systems with all life upon her. And I come back daily to why are we abusing our wildlife and exterminating God’s creatures? Spending time with my animals and Mother Nature is my saving grace. For when I am in the company of the Wild Ones there is code of conduct that is gentle, kind, respectful, familial and coded to survive and thrive. I remember the truth that we are all part of the same interconnected Energy Field. 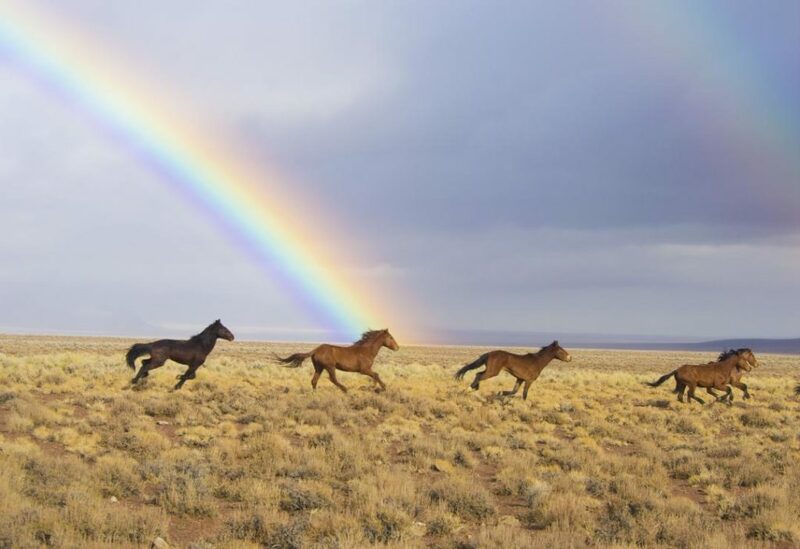 If you have ever spent time with a Wild Horse herd you will come to feel the beauty and magic of their family band. It is a very deep bond that Mother’s share with their foals. It is so similar to human Mothers and their young. The Stallions fight as hard as they can to keep their mares safe. There is a very clear code of conduct in nature and NEVER would you see a mass killing, round up or extinction taking place, it is simply not the way Mother Nature does things. So why are we not applying the same level of compassion and protection to their being rounded up and brutally chased and often killed to take them off of their public lands so a few Corporate Cattle Ranchers, Oil, Mining and Gas Companies can earn more money on our public lands? Most humans fear Wild Ones but we are taught this so it is nurture. It is not our nature to want to kill the Wild Ones when we are taught to understand and respect them. But some have made them into a commodity, a price tag, a profit center and asked us to forget our connection. AND THIS MUST END. There are some excellent excuses made up by those Industries that are making huge profits off of the sale of Mother Nature’s land and natural resource but I have to say that as a human being and as one who has been taught to stay connected to my natural instincts by the Wild Matriarchs that nothing that we are doing is NATURAL. Killing off or destroying our Wild Animals without any idea of how valuable they are to a thriving eco-system is not intelligent. So I ask you from the bottom of my heart to yours, take a moment and feel into the awareness of being a Wild Horse, or a Wolf, or a Coyote or a Cougar or a Bear. Feel what it’s like in your gut to be in their skin- the innocence, the simplicity, the naturalness and the wisdom- Do they really deserve to die because of our Fear, Ignorance, Arrogance or Misunderstanding? If you don’t think they should, please get involved and use your voice to speak up for our Wild Horses and Wild Life.